Anyone who finds themselves attracting public attention would hope that their yacht would provide sanctuary. But is this still possible in these days of digital transparency? If someone buys a yacht, they obviously have high expectations of the boat and how its equipped, but they are hoping for something else as well: “Privacy is extremely important – and often a primary motivation for the purchase,” confirms Benjamin Maltby, a British lawyer who specializes in yachts, advising first time-buyers as well as high-net-worth owners who already own several craft. Privacy does not mean that you can’t be seen. Especially if you are on a superyacht; because superyachts attract a lot of attention. The glamorous charm of an imposing boat casts a spell over fans all over the world. Some are interested in the technology, others in the design. Public interest in yachts, as symbols of the “rich and beautiful” classes, can also be driven by sheer curiosity, or even voyeurism. Yacht-spotters have turned their fascination into a hobby. They take photos and exchange information about the location and technical details of yachts. Digital technology has been a great boon to such people: they can share their information quickly and easily on sites like MarineTraffic and apps like Superyacht Spotter. Some of the profiles created through such tools are astonishing in their scope, and the available data can be used to chart a yacht’s movements in full detail. Depending on the application, the information gathered by the yacht-spotting community can be augmented with publicly available positioning data. 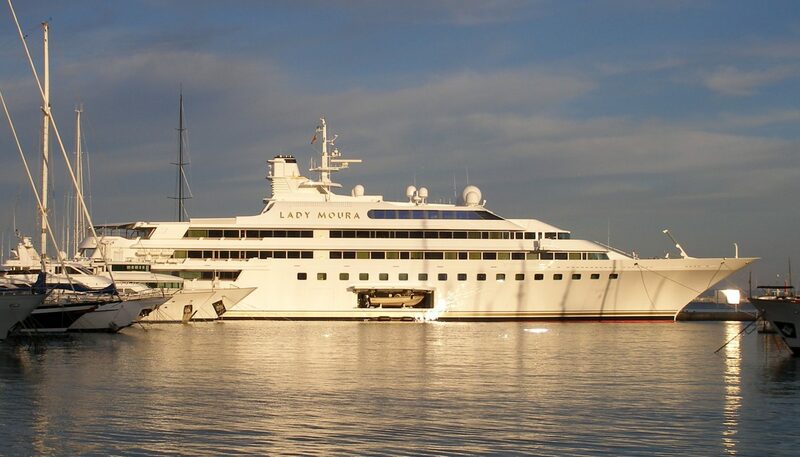 This is very easy to find for particularly large yachts: “Superyachts with a gross tonnage of 300 or more must be equipped with an automatic identification system (AIS) which shows their position in real time,” says Maltby. This data is open to the public: you can access it whether you’re using it to navigate safely or simply because you’re curious. Maltby points out that most superyachts are not that heavy, and that the information provided by an AIS alone is limited. “The AIS only gives the vessel’s name and various technical details.” But it doesn’t take much to augment this with more information. “It’s possible to find out who the owner is because ship registries are open for public inspection,” Maltby tells us. Benjamin Maltby British lawyer Benjamin Maltby comes from a family of keen sailors. He hasn’t looked back since being asked by an extremely wealthy client to create a company to manage super yachts. Benjamin Maltby now works for Keystone Law in London, and shares his expertise on Twitter (@BenjaminMaltby) in compact, informative “Keynotes”.